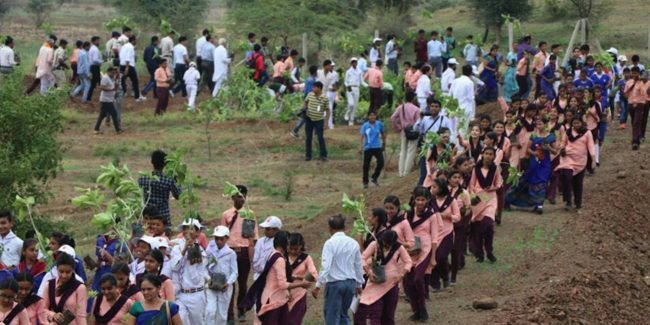 1.5 million volunteers from the central Indian state of Madhya Pradesh planted more than 66 million tree saplings in just 12 hours along the Narmada river, and thus set the new Guinness World Record. In July 2016, 800,000 people from the state of Uttar Pradesh set the record by planting 50 million trees in one day. The record made everyone happy, and Shivraj Singh Chouhan, the chief minister of Madhya Pradesh said that he was proud to report that people of Madhya Pradesh successfully planted 6.63 Crore saplings today. One crore is 10 million. The aim of this event was to raise awareness for the “make India green again” project. At the Paris climate conference, India pledged to increase forest cover to 95 million hectares (235 million acres) by year 2030 and invests $6.2 billion to reach this goal. Volunteers planted over 20 different species of trees in two dozen areas along the river basin to boost the chances of survival of these saplings. Yet, they also added that their concerns do not end with the planting, as those trees need to be watered and cared for. Sub Divisional Magistrate Madhya Pradesh addressed those concerns on Facebook, saying that aftercare is definitely more important do they hope to ensure that. It is not a government initiative alone, it is the commitment of children, youth and active junta of MP. Chouhan pointed out that he felt indebted to all who were planting trees, as they contribute to saving nature. By participating in a plantation, people are contributing their bit to climate change initiatives and saving the environment.